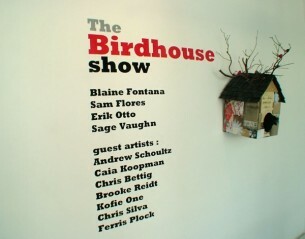 A collaborative multimedia installation with artists, Sam Flores, Erik Otto, and Sage Vaughn. For 3 months before the opening, the 4 of us crawled through alleys, trespassed into industrial properties, and accepted donations to amass an inventory of materials one could build a small house with. A week before the opening, we piled all the materials into a 17′ Uhaul. It was packed tight floor to ceiling, only an astronauts food is packed tighter. The following 5 days, the four of us burned the midnight oil painting, building and chopping these found materials. We even had several buddies that came along with the materials, a mouse, and 2 nuclear cockroaches managed to hide in all the materials. Once the installation was completed we had managed to create nearly 200 small collaborative pieces that lived in the install. A line had formed down the block before the official 7pm opening, and stayed that way through the whole night. It only took 2 hours to dismantle the show when it closed a month later.